PESHAWAR: A 10-year-old snow leopard died in Peshawar Zoo on Thursday. 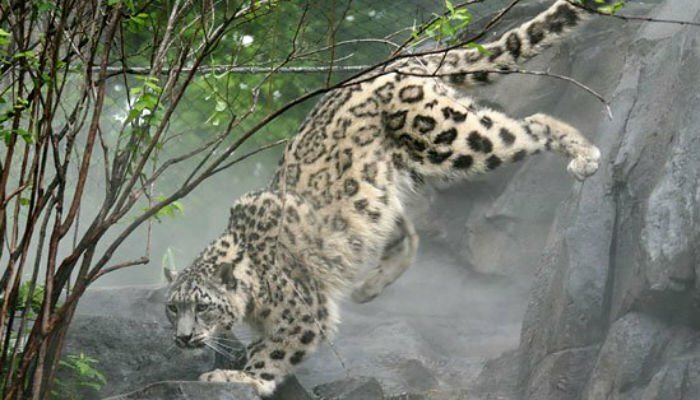 According to the zoo’s project director Muhammad Ali, the snow leopard was brought to the zoo from Galiyat and was scheduled to be taken back on April 15. However, it died before it could be shifted. Ali said that the leopard died a natural death as snow leopards don’t live longer than 14 years. The death comes a few days after a four-year-old fallow deer of American-African origin passed away in the zoo under mysterious circumstances. On Tuesday, an eight-year-old Bengali tigress died at the Lahore Zoo. The Bengali tigress was born at Bahawalpur zoo and brought to the Lahore zoo in 2014. A spokesperson said that the eight-year-old tigress was suffering from a parasitic disease which resulted in her death. Her body was sent to the University of Veterinary and Animal Sciences for postmortem. Snow leopard is an endangered cat and a few probably less than 10 left in Pakistan. This animal was brought to Peshawar for the inauguration ceremony of the zoo by Imran Khan despite the fact the animal couldn’t survive in hot climate. Hence Imran Khan is responsible for the death.